Team Blue is “Top Pixel” – Reflecting On Alteryx ‘Inspire 2018’ | Riverview Systems Group, Inc.
With the sold-out Alteryx Inspire 2018 event firmly in Riverview’s rear mirror, now feels like an opportune moment to reflect on what an amazing challenge this project was and how so many of our talented team stepped up their game to make it the overwhelming success it was. Marking our fourth consecutive year working with Alteryx on their all-important user conference, this year attracted more than 3,000 inspired users to Anaheim, Calif. The project was five months in development with our own Johnathan Regnier and Tim Healy, working in conjunction with executive producer, Robert Laney of Works, Inc., overseeing a pre-production and technical design strategy that featured concept development, content management, scenic design, full-scale lighting and audio support, including a 120’ wide curved projection surface. 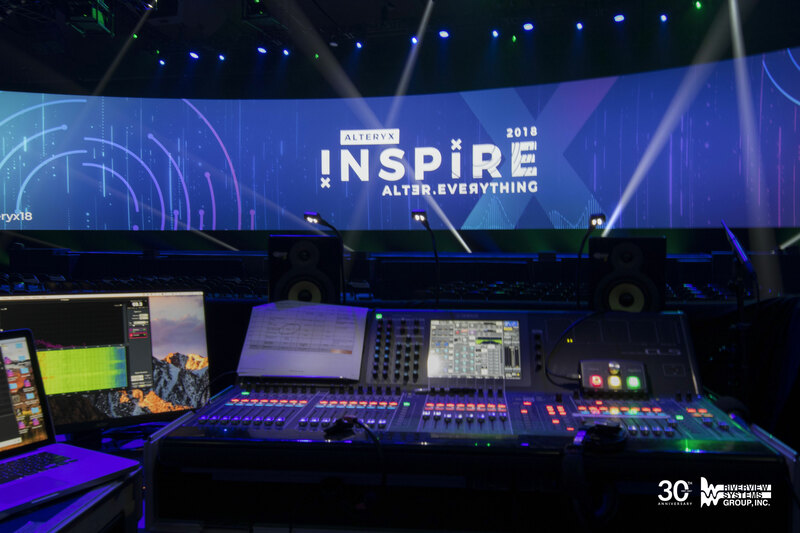 The Anaheim Convention Center and Arena is the largest venue ever for Inspire and that meant creating an event space that despite the size still felt intimate and personal for attendees. No easy task, but one that we handled flawlessly. Onsite we had a crew of 24 technical staff working tirelessly to make sure we exceeded client expectations, which included AV support for more than a dozen break-out training and meeting spaces, featuring two days of intensive and highly sought-after Platform Training. Riverview also supported the Solution Center, where attendees could meet and talk informally with the Alteryx experts. We’re delighted to be recognized as “Top Pixel” for the passion and commitment to elevating the live event experience. Evan Williams, CEO & Co-Founder, Riverview Systems Group, Inc.